El Dia De Los Muertos, or The Day of Dead, is observed in the southwestern United States, most of Latin America, and parts of Europe, Australia, New Zealand and the Pacific Islands. Day of the Dead coincides with the Roman Catholic festival of All Saints Day on November 1 and All Souls Day on November 2. We are showing our photos from the 2015 Pacific International Quilt Festival and from the exhibit of ofrendas (altars for departed loved ones) at the Desert Botanical Garden in Phoenix, Arizona. The amazing fabric sculptures of Susan Else were one of the highlights of the quilt show for us ! These are intricate, innovative pieces of cloth art. The daughter of professional artists, Susan was at first hesitant to follow in her parents' footsteps, but then became intrigued with the world of fiber arts. She explains her technique and purpose in making fabric sculptures: " I treat cloth not as a flat surface, but as a wild flexible skin for three-dimensional objects." Family Life shows a father, mother, and child skeleton enjoying "quality time" together, as they playfully interact with each other. Complementary colors of yellow and grape violet provide a stunning contrast and play up the stark bony quality of the ribs and feet. Family Life is made of collaged and quilted cloth applied over commercial plastic skeletons. On the bones are sayings and comments about the family structure. The head of the child contains the vintage poem, "Monday's child is fair of face, Tuesday's child is full of grace". Susan explains that one of her purposes in creating these sculptures is to explore the world of opposites: cloth and bones, joy and grief, the temporal moment of family happiness on earth, versus eternity and the ultimate end. At PIQF, we had a wonderful time chatting with Susan, a delightful and supremely talented artist. 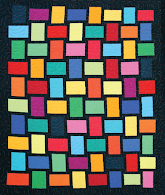 Susan is available to quilt guilds and art groups to give instructional talks and workshops. For more information, please check out her very informative website, Susan Else Sculpture. 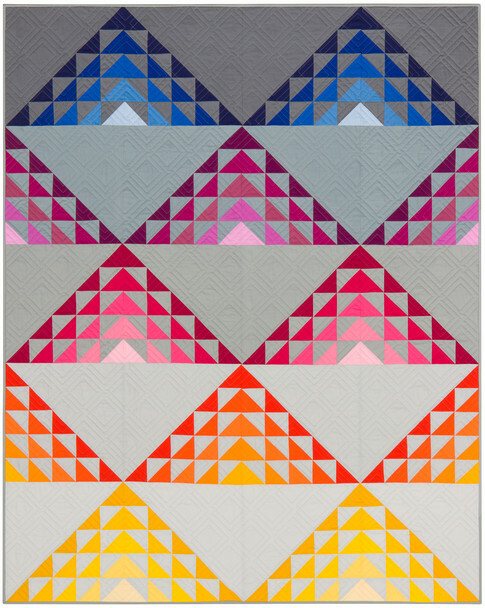 Sandra Proudfoot notes, "Addressing the subject in a somewhat playful manner, the quilt speaks to the improper use of electronic devices. Taking the theme of the...Day of the Dead Festival, a sugar-masked corpse hangs from a cross of cellphones as tiny cadavers dance mischievously amongst colorful marigolds, known as Flowers-of-the-Dead that decorate cemeteries during festival time." We thought this was a very creative and artistic way of delivering an important safety message. Sandra adds, "It is a reminder about distracted driving" [using a cellphone while driving a car]. The skull is decorated with flowers in the traditional way of adorning Day of the Dead skulls; and its shroud is done in three-dimensional folds. 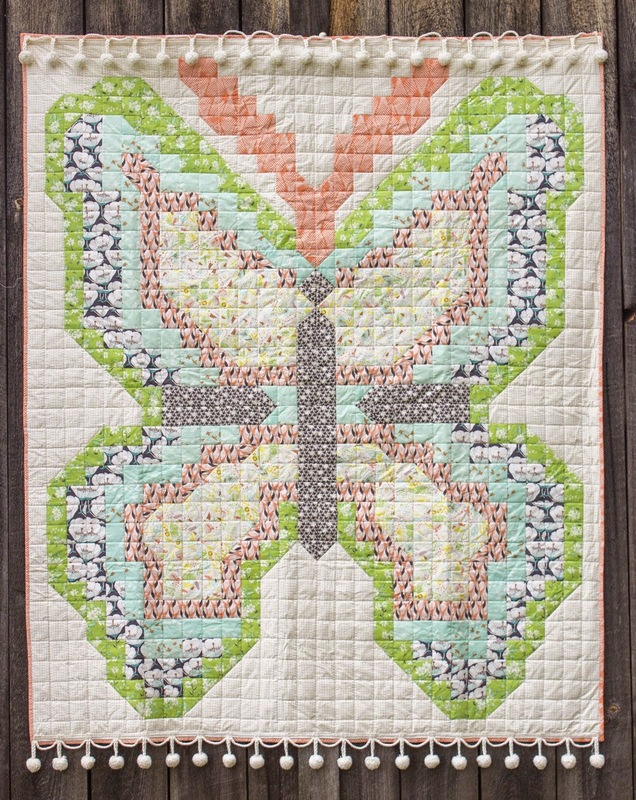 Sandra's original design is hand-appliqued and longarm quilted (by Mary Light). Sharon is the designer of the Handy Caddy bags for carry quilting and sewing notions, so she appeared at PIQF as a vendor. 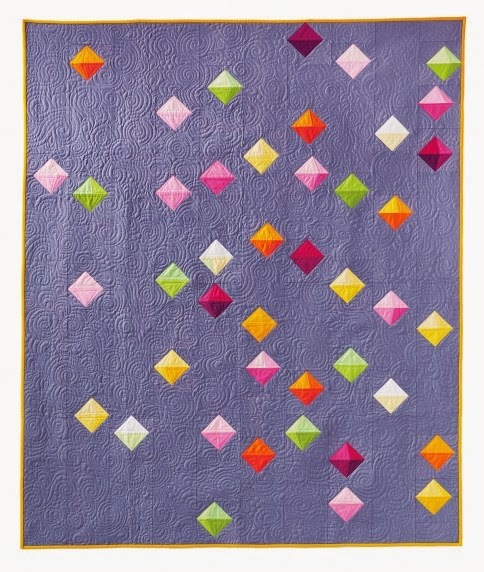 However, she has an interesting story to tell about how her quilt came to be featured. 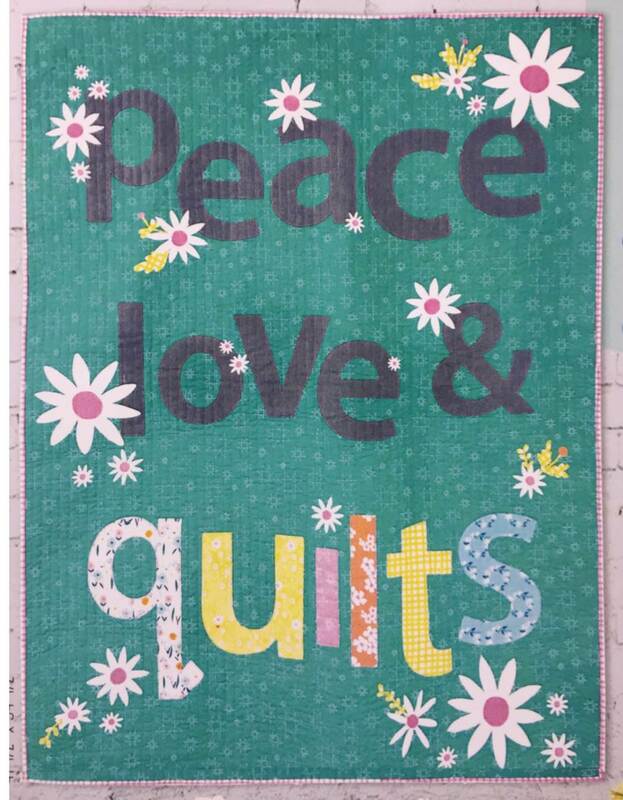 She writes, "On set-up day, I found myself filling my [vendor] booth with my signs and displays, and sadly, I didn't have a space to present my new favorite quilt, the Day of the Dead quilt. I noticed that at the end of my aisle, there was empty space on the walls. 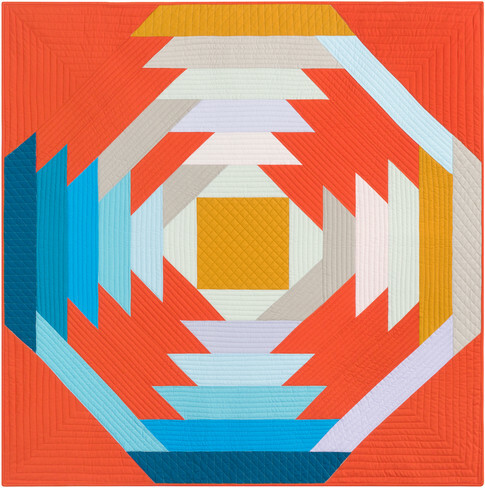 I had wanted to enter my quilt into the show, but it was past the deadline. I asked if I could just put it up for the show. 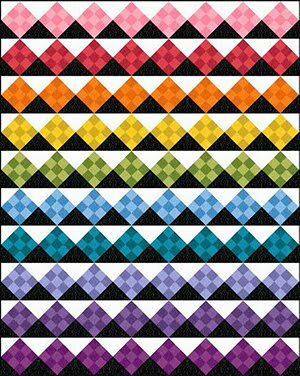 I was ecstatic when [the quilt show management] said yes!" 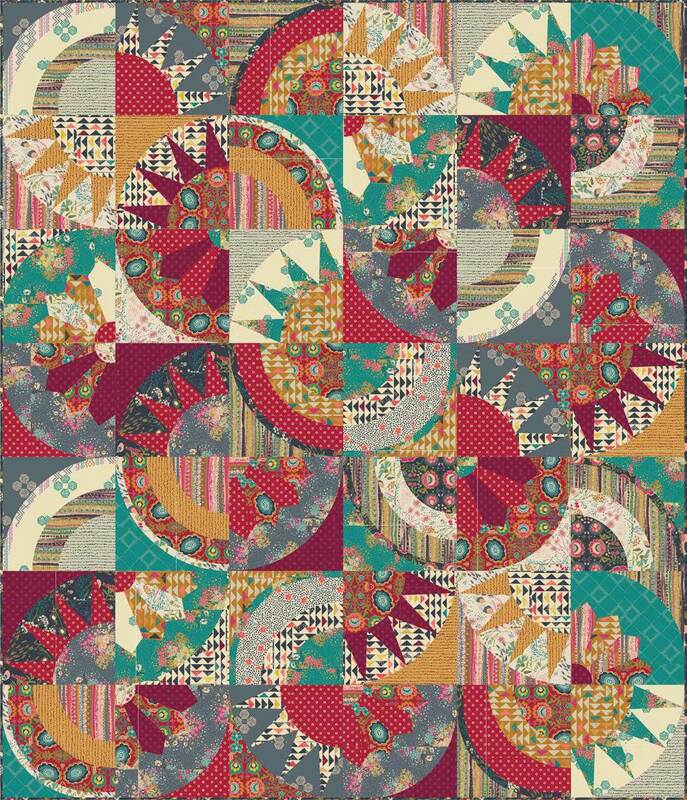 The sugar skull fabric is from the Fabric Fiesta collection by Dan Morris for RJR Fabrics. 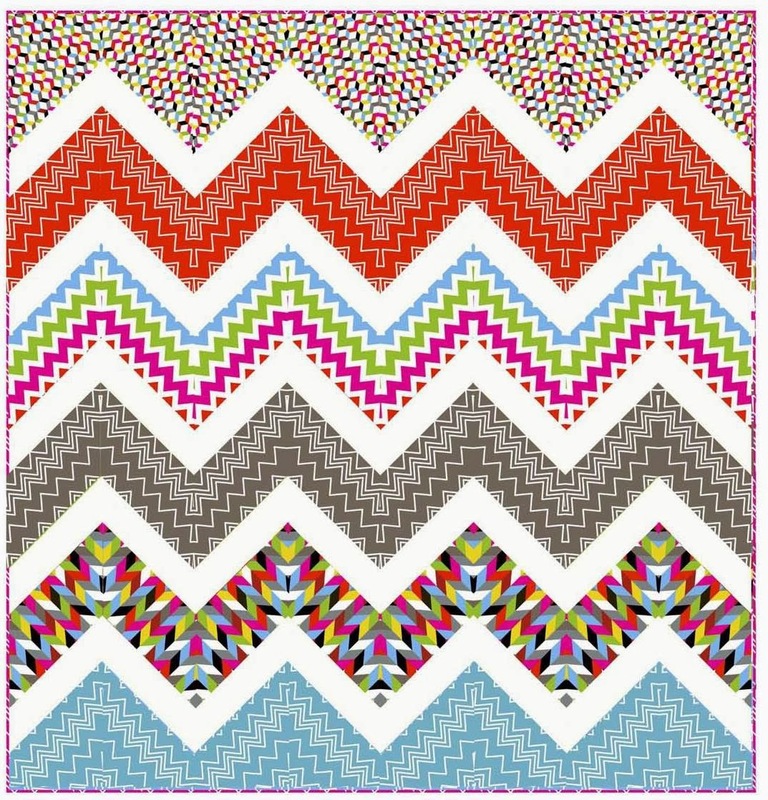 These are some of the most colorful and interesting fabric panels we have seen lately! One 24 x 44" panel contains six skulls which can be cut apart and arranged however you wish on your quilt. Sharon notes, "I broke my vow not to buy more fabric when I found these beautiful Sugar Skulls. Too bad that it is [currently] discontinued. Day of the Dead is not going out of style soon." 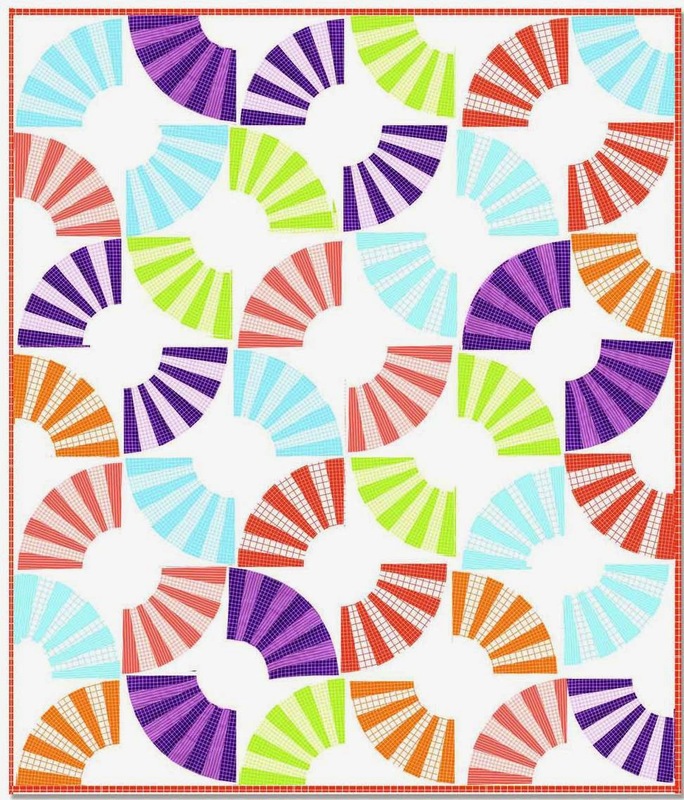 Note: As of this post, the sugar skull fabric panel - from the Fabric Fiesta collection by Dan Morris for RJR Fabrics - can still be found online at Equilter. Continuing on to Phoenix, Arizona, each year the Desert Botanical Garden holds a week-long Dia de los Muertos celebration, including an exhibit of ofrendas (altars). Traditionally, ofrendas help people to remember and celebrate the dearly departed. Like all traditions and celebrations, the ofrendas have changed in response to shifting social contexts. Here are some outstanding examples. Patricia Silva graduated with honors from the Art Center of Tucson (Arizona) in 1995. Raices Familiares (Family Roots) features beautifully framed photographs of family members along with candles, flowers, and elaborately painted and embellished skulls. Patricia says, "I discovered that my own life experiences, both joyful and painful, have brought me to where I am today. I'm thankful for the gift that god has given me and humbled by each unique experience my art journey brings." Patricia Silva's use of bold and bright colors in her creations reflect her love and admiration of her Hispanic heritage and culture. As a folklorico dancer in her youth, Patricia was introduced to the beauty of the many rich colors used in the embroidered costumes from various regions of Mexico, such as those from the state of Oaxaca. She has painted and decorated these skulls, shown above and below, with butterflies, flowers, hearts, and other symbols of love and happiness. Monica Gisel Crespo's work, which is inspired by her Oaxaquenan heritage, has been shown in Mexico and the United States in multiple solo and collective exhibitions. This installation depicts the Earth Mother Goddess, who is considered the female aspect of the primordial [Aztec] god Ometeotl. The striking goddess figure is illuminated from within and adorned with corn husks, a feather headdress, and a necklace depicting sacrifices made in her honor. The flowers represent fertility and abundance. Martin Moreno is an award-winning Arizona artist and an educator in the arts. He says, "The thought of death being the end is not a part of my belief. I believe our destination and journey to the next world is a reality... Our time here is but a blink in time, our existence will be but a memory; only the love we share with others during our time here will ensure that our footprint on earth will endure." This ofrenda invites the viewer to record the names of their loved ones who have traveled on to the next world. The names are written on tissue paper resembling flower petals. Martin Moreno is the resident artist at Xico, Inc., a multi-cultural arts organization in the heart of Phoenix, Arizona. In 2011, he received the Governor's Arts Award, and was named Arizona's Artist of the Year. Zarco Guerrero is an award-winning sculptor, mask-maker and performance artist from Mesa, Artizona. This stunning altar, placed on the floor, features an Olmec head that is nearly five feet tall. Giant heads carved out of stone are the most iconic images of the Olmec. The name of the installation, Olmecalaca, is a contraction of the words "Olmec" and "Calaca" (skull). Zarco Guerrero says, "The Olmecs are considered the mother culture of Ancient Mexico. The Maya and the Aztec inherited the artistic style and aesthetic of these highly sophisticated people. The Olmecs were the first civilization to express human emotions in sculpture." "It is in Olmec Art that we see the first depiction of La Calaca or Miquiztli [a symbol of Death in the Aztec calendar.] The use of La Calaca as the symbol for transformation has been one of Mexican Art's most often seen visual images from ancient times to the contemporary, and has become synonymous with the celebration of Dia de los Muertos." The large skull shown above has translucent amethyst-colored eyes that appear to gleam, reflecting the spotlight. The skull below, one of two that flank the installation on sticks, wears a traditional flower headdress. Zarco Guerrero has exhibited and received international acclaim and many awards, including the Arizona Governor's Arts Award and the Artistic Excellence Award from American Hispanics in Higher Education. You can see a gallery of his work in various media on his website. Image credits: Photos were taken by Quilt Inspiration at the 2015 Pacific International Quilt Festival and the Desert Botanical Gardens. 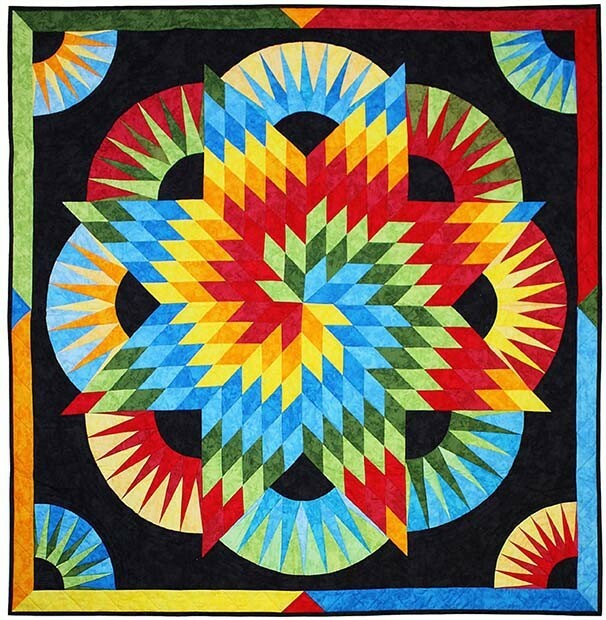 We had a fabulous time at the 2015 Pacific International Quilt Festival, the largest quilt show on the Pacific coast of the U.S. Beautiful quilts were displayed from around the world. 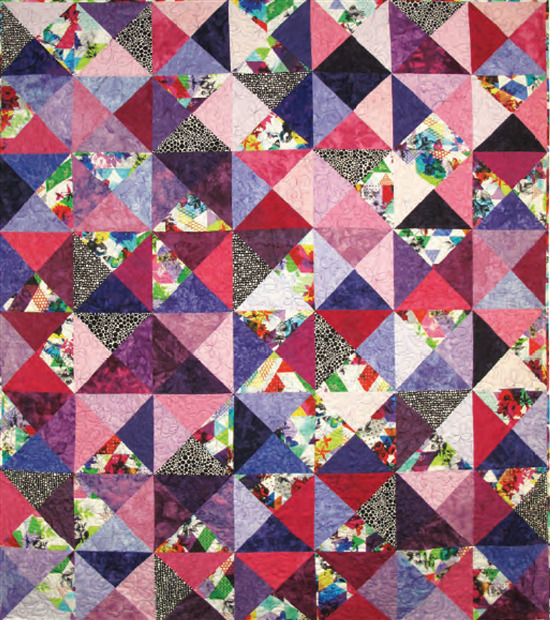 All the quilts were designed and constructed at a very high level of talent. We are showing some prize winners, but we also will be showing you some real gems that did not win prizes. 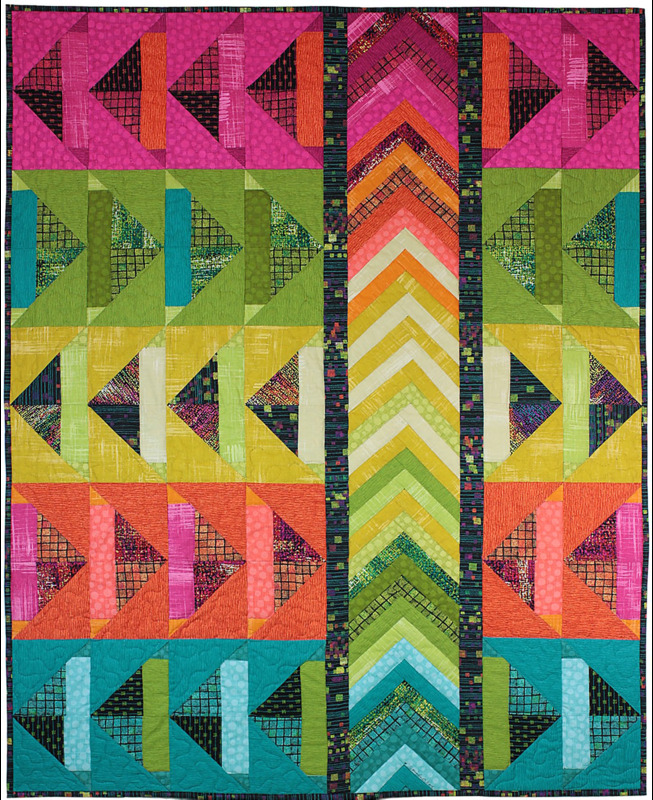 For a complete list of prize winners in the World Quilt category, please click here. Today, we're featuring Part I of our highlights ! Kimiko explains, ...."In 2003, the Japanese Aerospace Exploration Agency launched a planet probe, Hayabusa 1. Hayabusa 1's destination is to the asteroid Itokawa. The journey took two years. On the way there, Hayabusa 1 came close to Earth. From that point, Hayabusa 1 took some photos of Earth. One of the photos inspired my quilt." 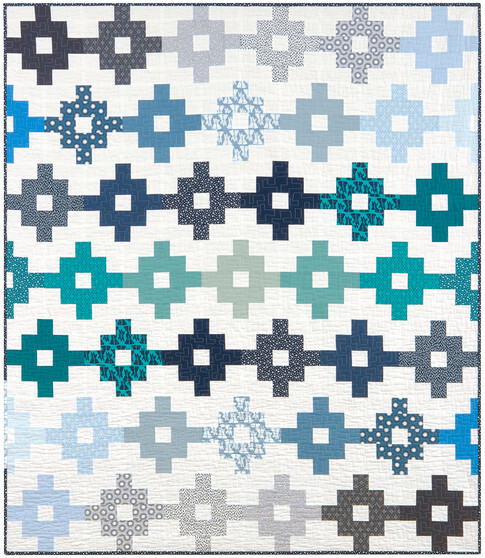 Therefore, this spectacular quilt depicts Planet Earth as seen from outer space. We were fascinated by this quilt and in awe of all the interesting new information we learn about the world at quilt shows. Kimiko continues, "I worked with the cathedral windows method." Kimiko's original design is all done in small cathedral windows blocks, sometimes embellished with lace overlays, as shown here. 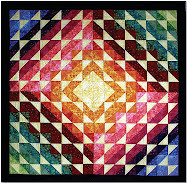 This huge quilt is completely quilted by hand. We were very impressed with Kimiko's most significant creation. 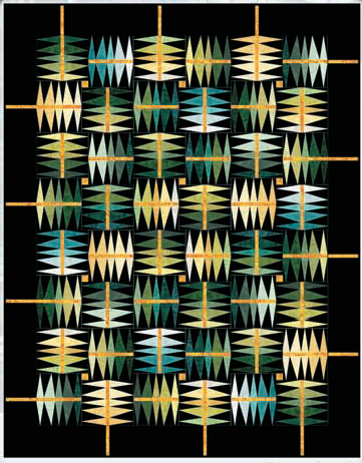 Frame of Mind won Honorable Mention for wall quilts. 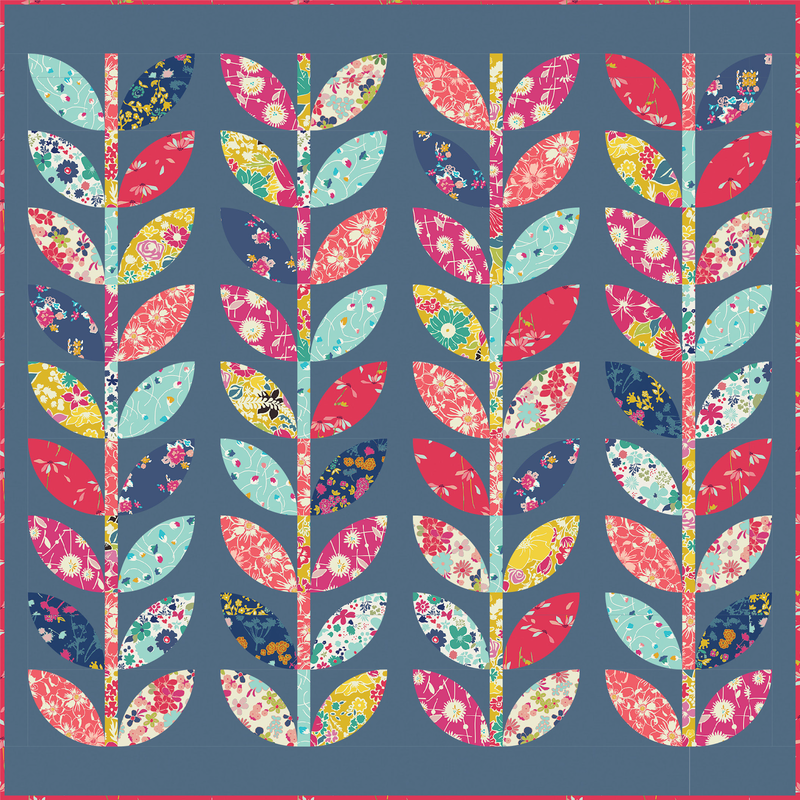 Flora explains about her original design, "My attempt to make a three-in-one quilt that clearly showed the images of three different women definitely left me on pins and needles! I'm hoping that viewers will also be on pins and needles as they walk by and see the images magically change from Jackie Kennedy to Oprah Winfrey (shown here) to Mother Teresa!" 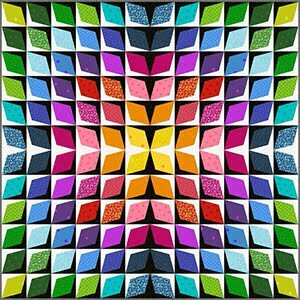 In this amazing quilt, the photo in the frame changes from one person to another, depending upon where you stand in front of the photo. In this close-up above, we are standing on the left hand side, so the photo shows First Lady Jackie Kennedy (wife of U.S. President John F. Kennedy). If you stand on the right side of Flora Joy's quilt, the louvered strips of fabric will display the visage of Mother Teresa. 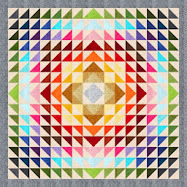 We were really intrigued with this quilt, as were a large group of admiring viewers standing around it. 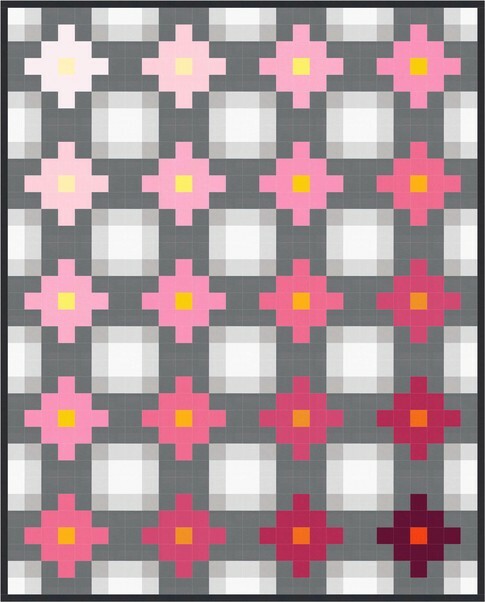 The technique is described in Flora Joy's October 2015 book, Trispective: The 3-N-1 Quilt, published by AQS. 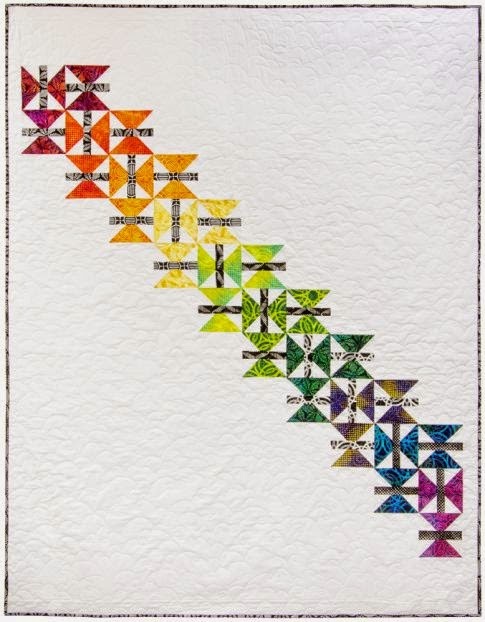 Sue states, "The inspiration for this quilt was one pillow-size traditional Hawaiian leaf pattern. 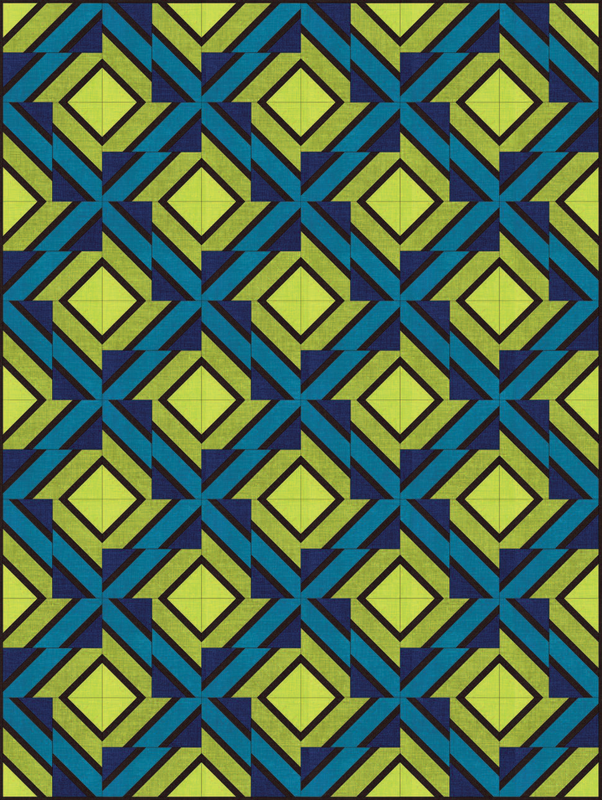 I kept gathering patterns and ended up drawing 4 block patterns myself. 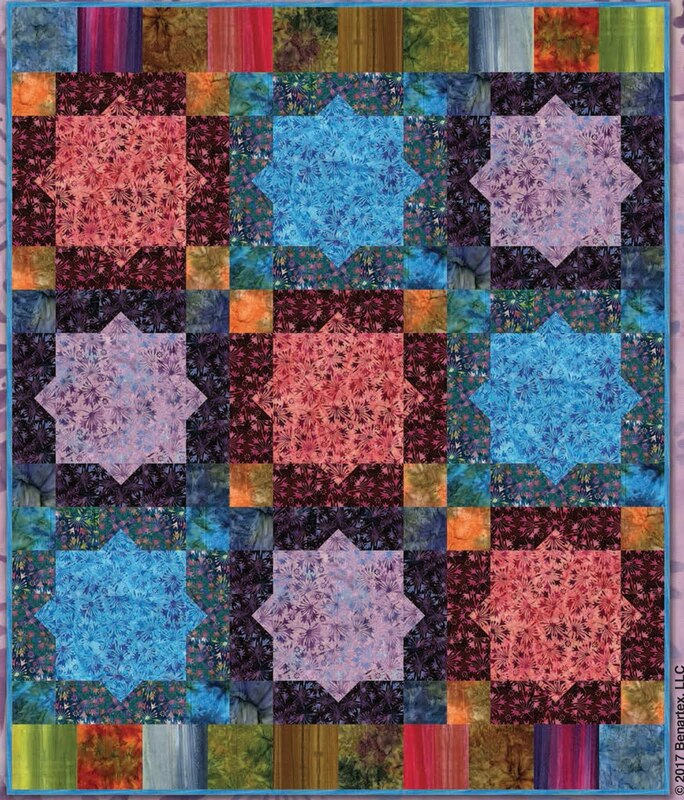 Using the same (white) batik fabric for the block and sashing gives it a sparkle. 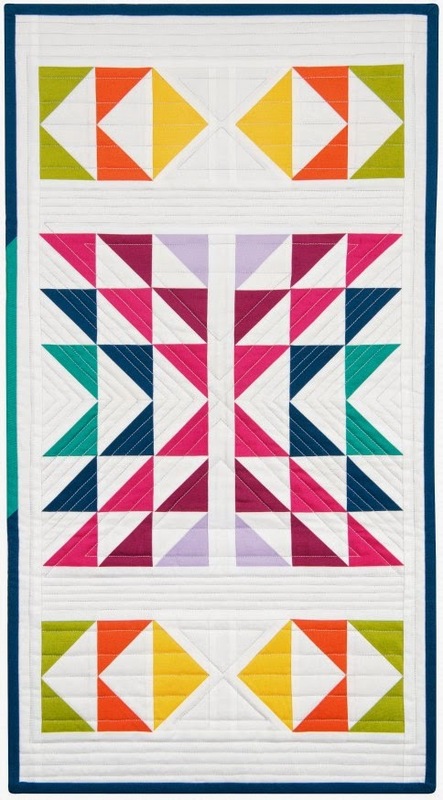 It took my small quilt group to help me decide on the 'on point' layout." 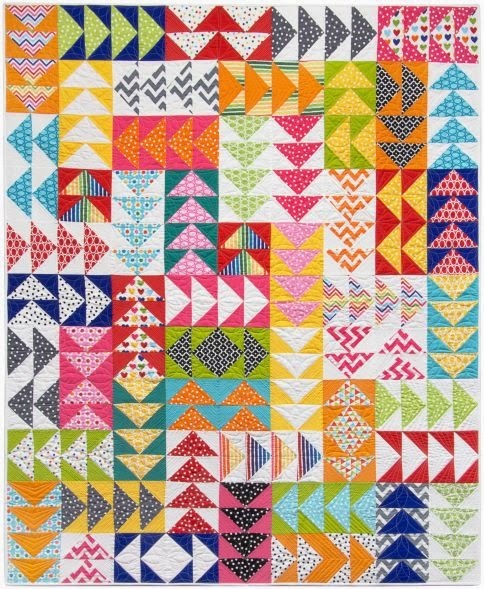 Sue notes, " This quilt hangs in my bedroom, and every morning it reminds me of my wonderful vacation in Hawaii." These gorgeous blue batik Hawaiian motifs were all appliqued by hand, then Sue's lovely work was long arm machine quilted. 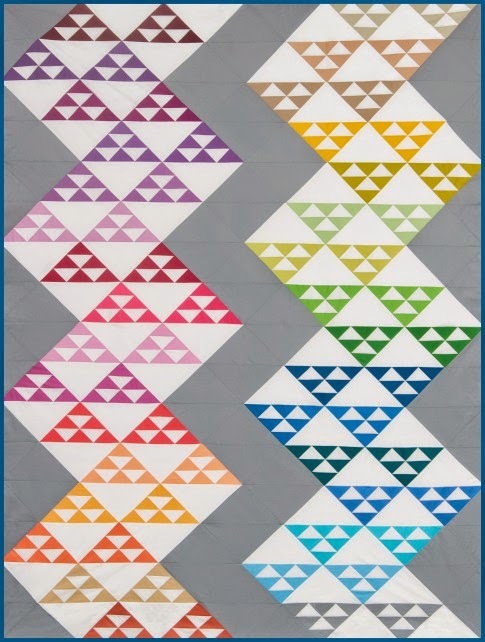 Winner of a Judge's Choice award, "Blue Hawaii" was one of the prettiest quilts we saw at this year's P.I.Q.F. 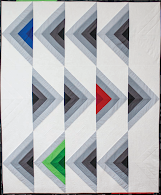 Valerie notes, "I like to work on challenge quilts because it forces me to work outside my comfort zone. 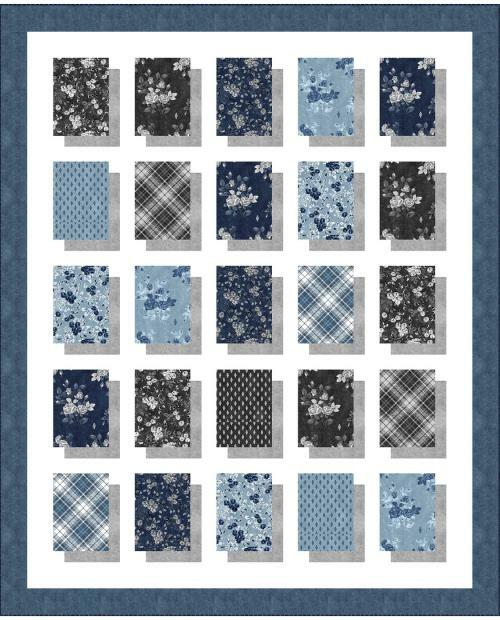 My Guild of Quilters of Contra Costa County issued a challenge for our 2015 show to combine black and white fabrics with one other colorway.... I also volunteer at the Lindsay Wildlife Museum and was asked to do a program on bees for kids. 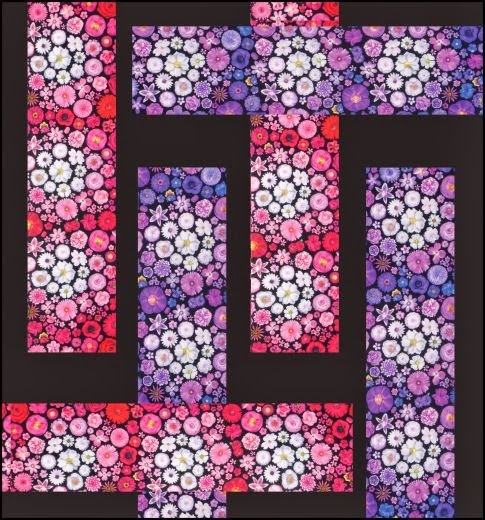 I became fascinated with bees and wanted to combine what I learned about them with the quilt challenge. So, I chose the color of honey as my third colorway, and made 'Beatrice' [above] as the queen bee of the...hive. " 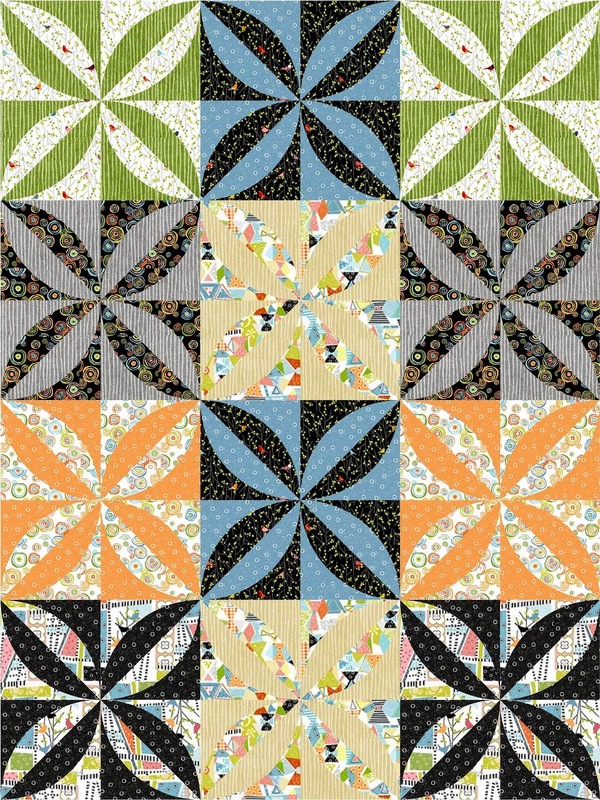 We love Beatrice's expressive little face, the wonderful background fabric, and the hexagon shape of a beehive cell that Valerie has chosen for this delightful quilt, which is hand appliqued. Valerie adds, " I realize that I [humanized] Beatrice, but it was my way of trying to soften the stinging images of bees for kids..... This is an original design that came to me in a flash when I saw the [tiny silver] metal crown and scepter at a hobby store." 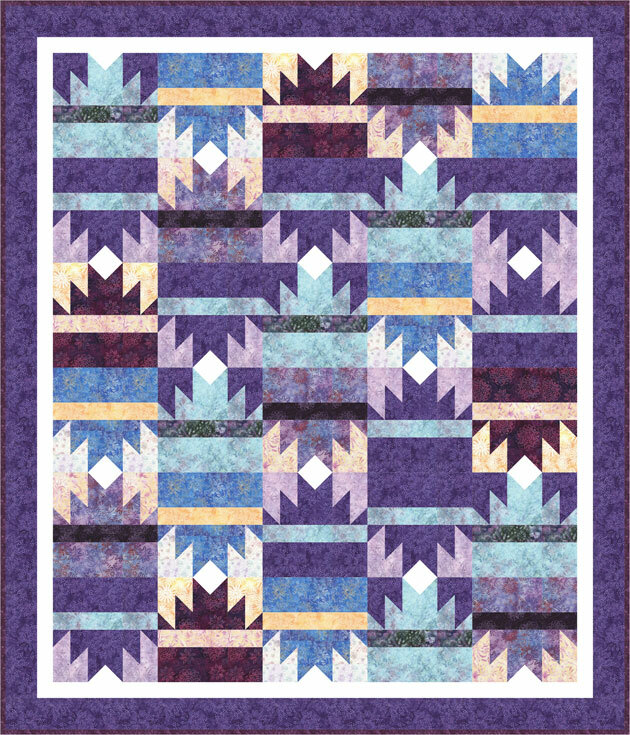 Sue writes, " A friend and I purchased this Baltimore Autumn pattern by Pearl Pereira together at PIQF in October 2013 from one of the many wonderful vendors. 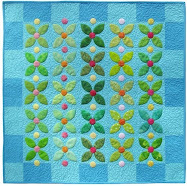 I love needle-turn applique and prefer working with batiks, as they don't fray when trimming and clipping." 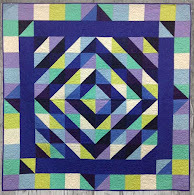 Sue continues, "This was my first ever Baltimore album style quilt and a real challenge to get it completed for this year. It hangs in my dining room from September through Thanksgiving. " 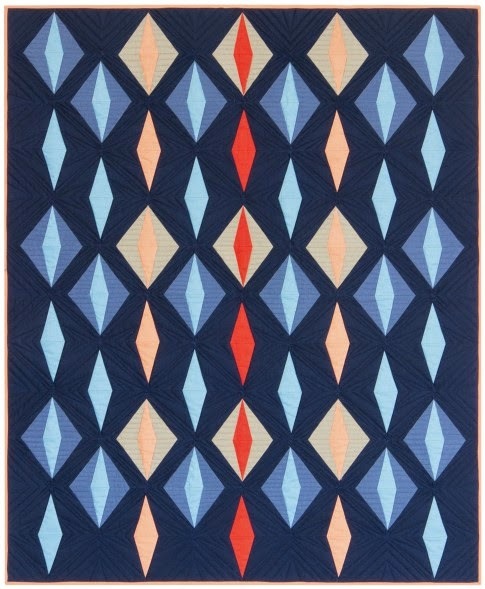 We can only imagine the hours of loving work that went into this stunning quilt, a true heirloom. Color saturated batiks fabrics work perfectly to convey the intensity of autumn hues. 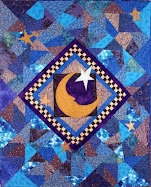 Just like her "Blue Hawaii" quilt shown above, Sue's work here is hand-appliqued, machine pieced, and long arm machine quilted. 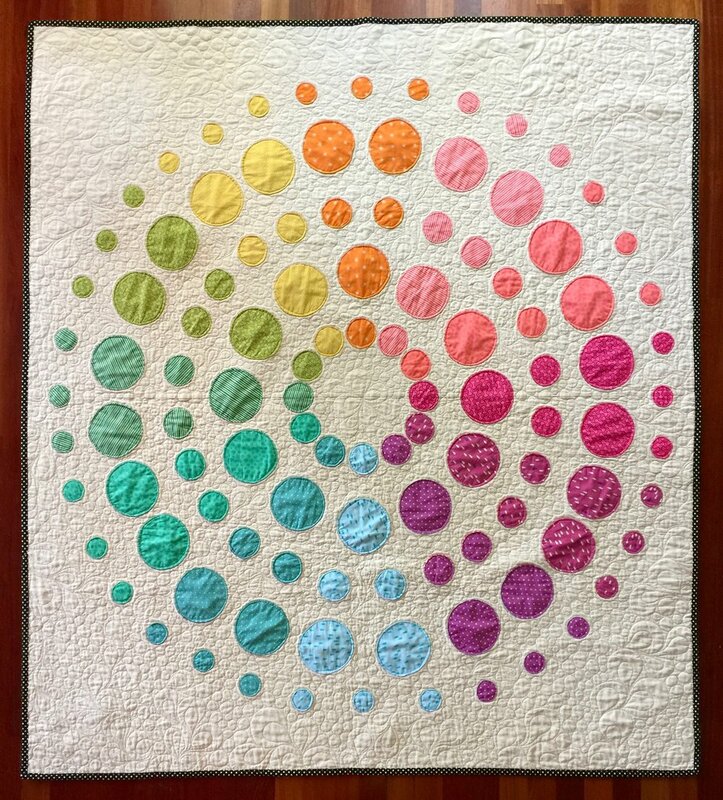 At the recent Diablo Valley Quilters show, we were excited to see a special exhibit by sisters Aileyn Renli Ecob and Jean Renli Jurgenson. They are award-winning artists whose work has been featured in national and international shows, galleries, and special exhibits of fiber art. We were mesmerized by their work, and we hope that our photos convey a sense of their artistry with fabric and thread. The colors, luminosity and intricate details drew us to this piece. Aileyn Ecob says, "My inspiration is usually from nature — either a photograph or an original drawing. The strong colors and bold designs of flowers, fruit, vegetables and trees give me the inspiration for much of my work." 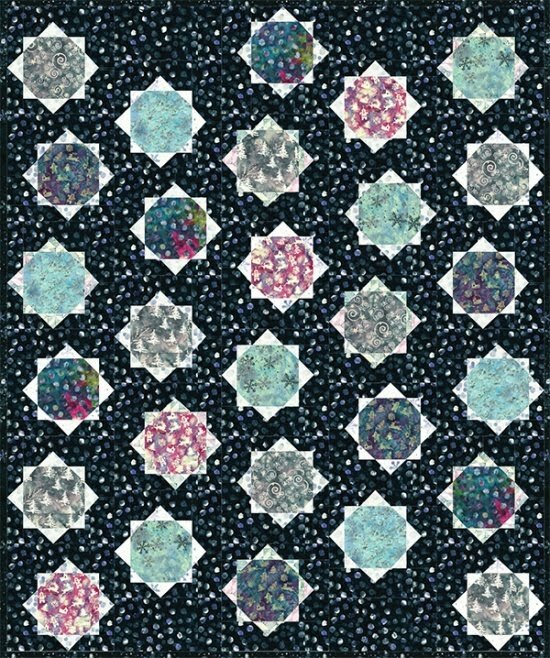 In Globe Thistle, dozens of individual star-shaped flowerets were cut free hand and machine stitched to the background fabric. Aileyn often uses thread painting to heighten the realism of her work, as shown in the closeup photo below. This is the second in a series of works by Aileyn Ecob using the circle-in-a-square block. In Music of the Spheres, three large overlapping circles emerge. 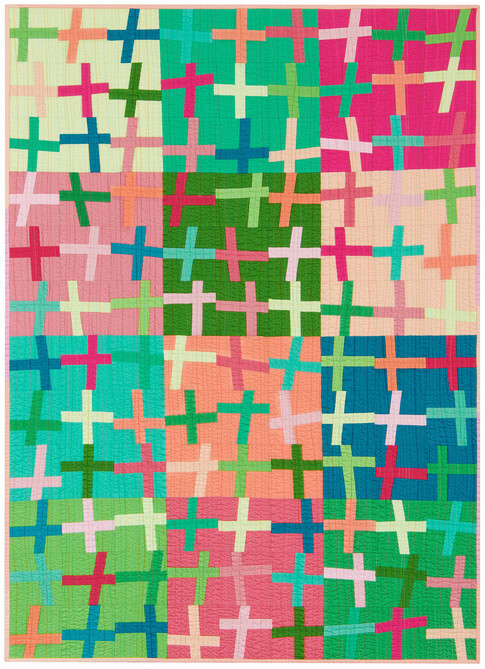 The restful blue and teal hues and interesting textures are punctuated by magenta squares. 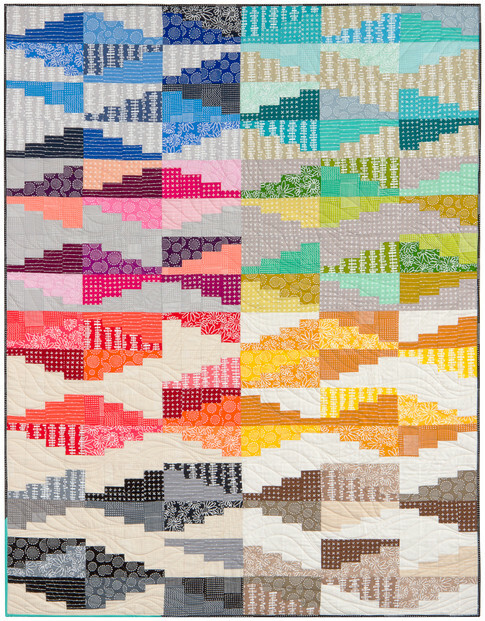 Aileyn's precise hand quilting emphasizes the curves in this piece. 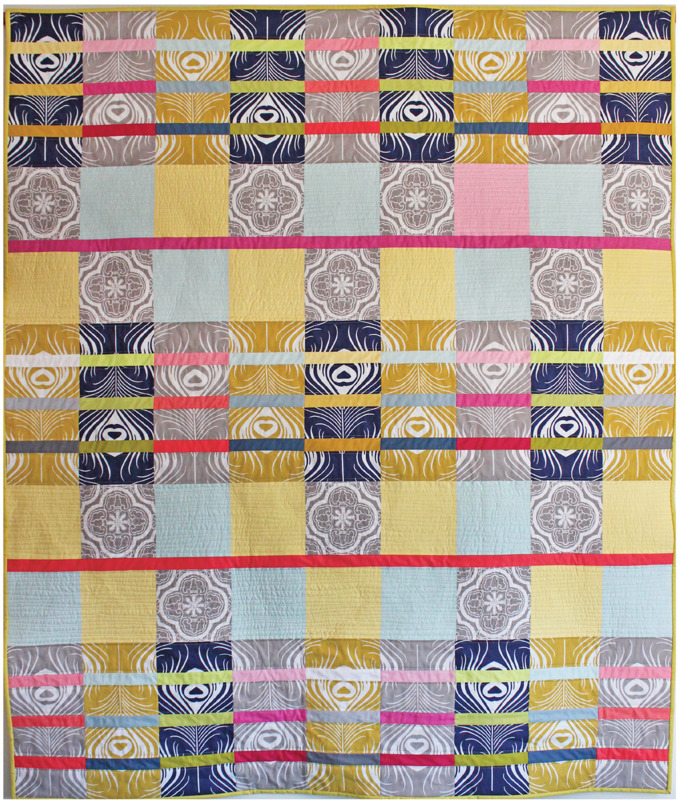 Aileyn says, "[This is] one of the first art quilts that I made. I experimented with paint on the background, acorn, and acorn cap. 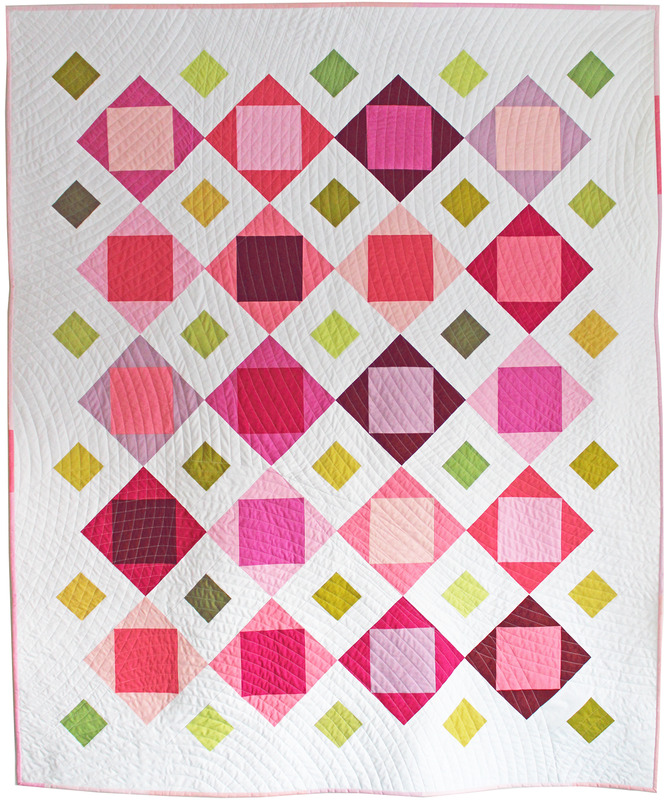 It’s hand quilted (and hand appliqued)." In the background, trapunto leaves were achieved by dense stippling by hand around the leafy shapes. 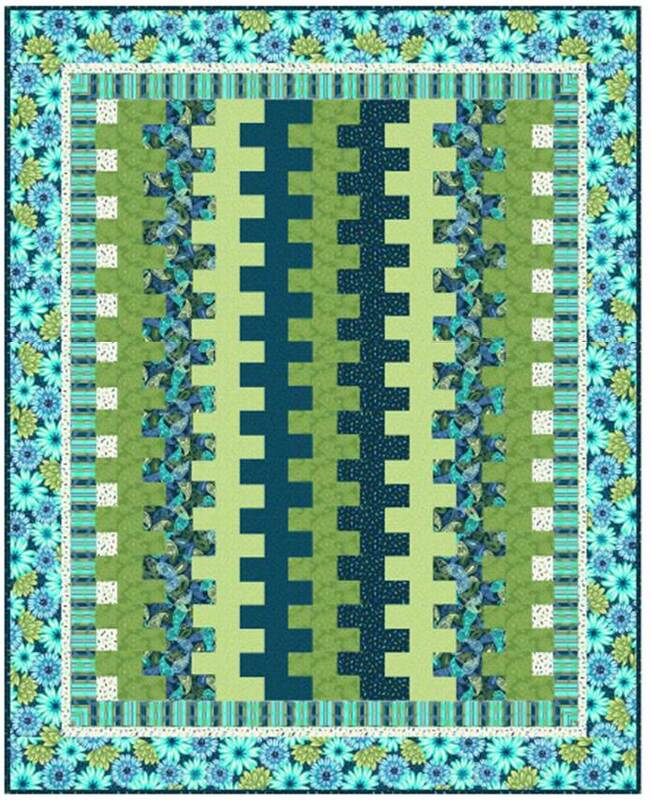 This dramatic wall quilt was inspired by a photo Aileyn took in Oregon, at a park memorializing the pioneers of the Oregon Trail. 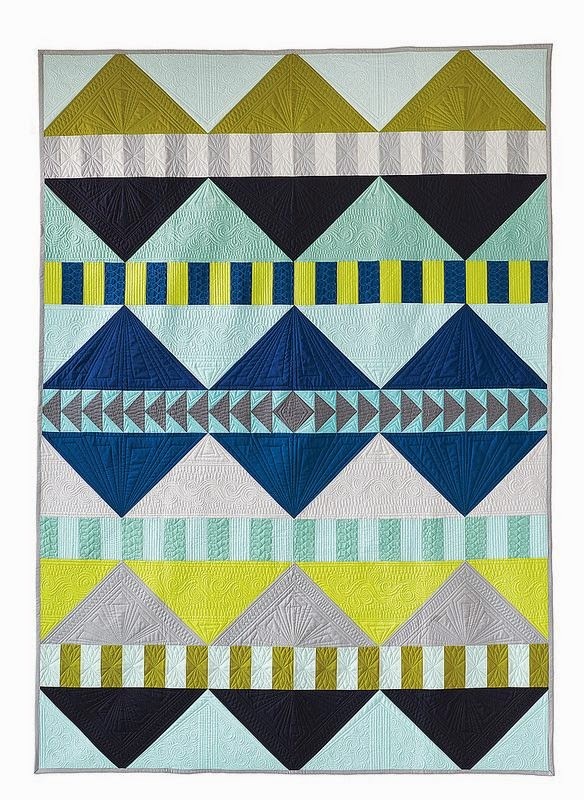 With careful fabric selection and needle-turn applique, Aileyn has captured the brilliant color and symmetrical form of the sumac, which is highlighted by the dark backdrop of the forest. The background is enhanced with hand quilting. Moving to the right of the exhibit hall, we come to the work of Jean Jurgenson. She says, "I find inspiration in the minutiae of the world around me — the juxtaposition of old and new, an unusual perspective, the color of sunlight after a rain. All these bits of life fill me and make me want to create." Tangaroa takes us into the scene as we look down the boom of the sailboat, and across the rail to the azure sea. 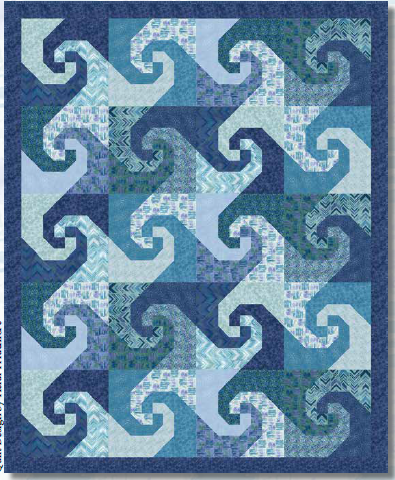 Jean says, "[This quilt was] inspired by a photo my daughter took from her father-in-law’s sailboat, the Tangaroa, off the coast of Oahu. I loved the perspective she captured of the boom and sail." The sail is three-dimensional, and the ropes are made of string. Jean says, "I carved the wooden block-and-tackle from balsa wood." In this stunning piece, Jean used paint on fabric to depict the waterfall fountain at Yerba Buena Gardens in San Francisco. She accented the scene with realistically imagined Chihuly glass globes, which are appliqued to the fountain. They appear to be floating in the water, just as they would if they were part of a Chihuly installation. A really interesting piece in black, white and gray, Best Man focuses on the crisp collar, white pleats, and black tie of the tuxedo. Jean Jurgenson explains, "My son, Josh, was getting ready for his brother, Jake’s, wedding. I rendered the hands, face, and shirt details with Tsukineko inks on a gradation of gray fabric I painted with Setacolor paint." Architectural precision must have been required to construct these buildings in fabric, and yet the method of construction is nearly invisible. Jean says, "This piece was done from a photo taken by my daughter, Lee, from their 14th floor apartment on Hong Kong Island. My granddaughter, who was a toddler, would stand at the window and wait for a red taxi to drive by and call out “taxi!” - thus the title." 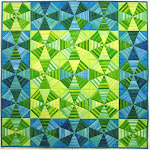 Aileyn and Jean are members of Studio Art Quilt Associates. For more of their work and current exhibits, please visit their website at Fiber on the Wall. 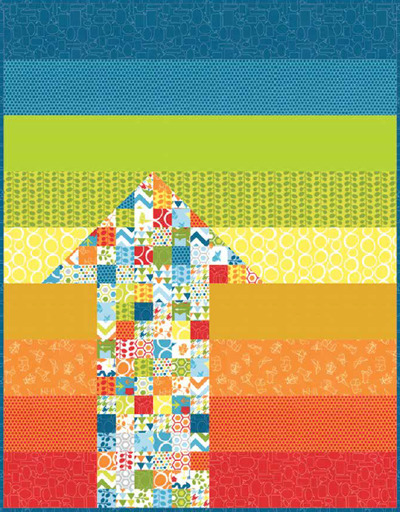 Welcome to a new season of quilt shows ! We had a wonderful time at the Diablo Valley Quilters' show in California. 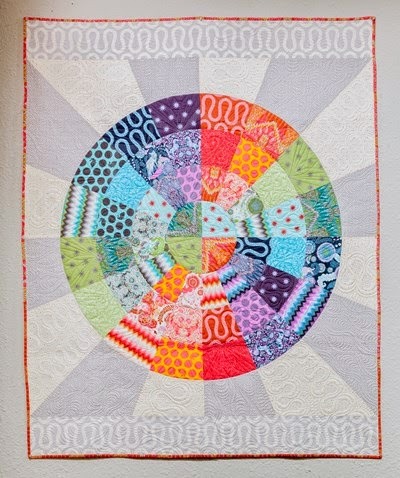 We wanted to share a few more of our favorite pieced and appliqued quilts from this fun show. 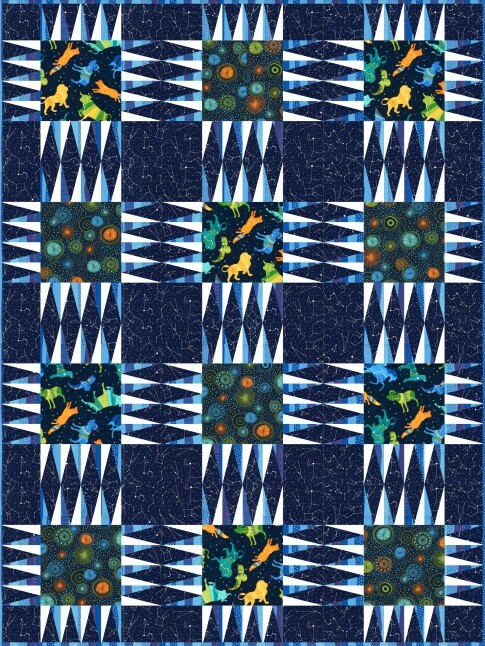 Charlene Dakin says, “I designed this quilt from a photo I took (the bears were not in the photo!) I took Gloria Loughman’s class at Asilomar on tiling landscapes. 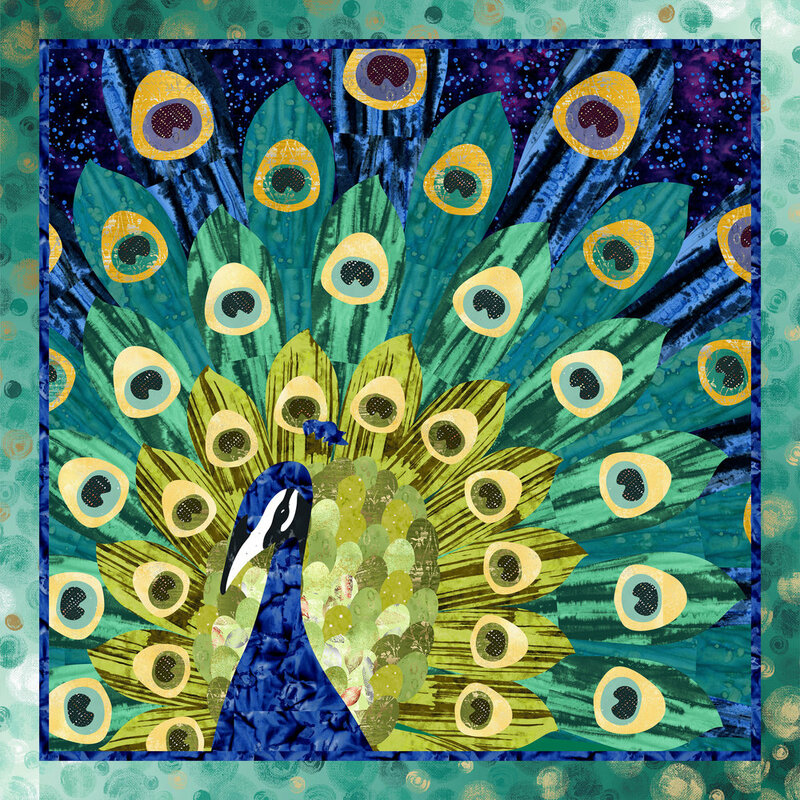 Her class was very enjoyable and well worth the cost.” Charlene created a beautiful watercolor effect of the sunrise, using Gloria's mosaic tile process. 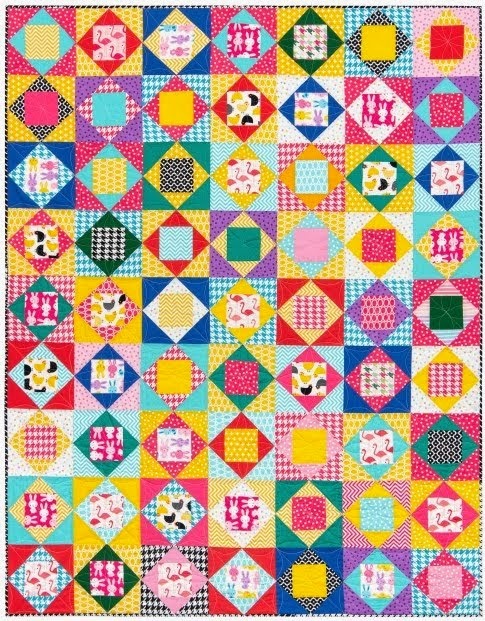 Happy Days refers to the fact that Linda Reid completed this quilt! 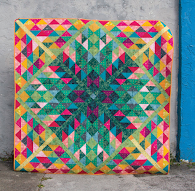 This is one of the prettiest Farmer’s Wife Sampler Quilts we've ever seen. 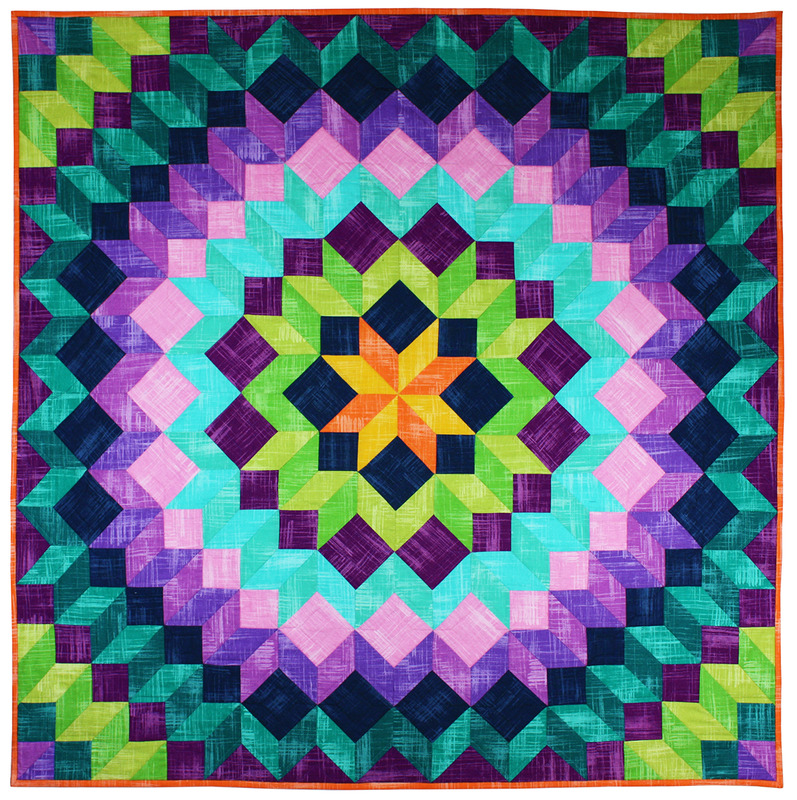 Linda Reid says, "I had finished 2 years of Civil War fabrics and needed something bright." 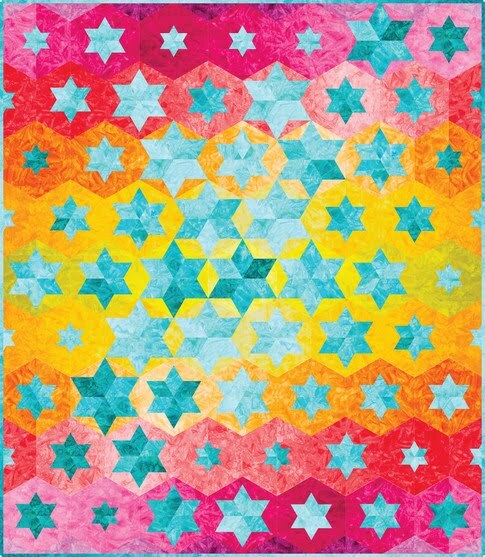 We love the color combinations of turquoise, apricot, teal and pink, and the beautiful print border. 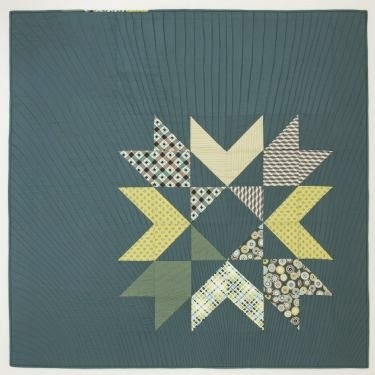 In addition to quilting in the ditch, each block was quilted with a scrolled or spiral pinwheel design. 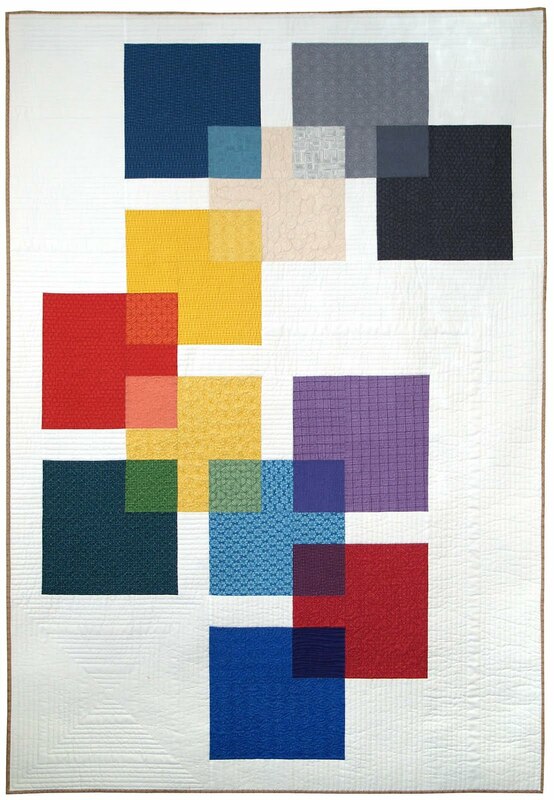 The blocks are based on The Farmer's Wife Sampler Quilt: 55 Letters and the 111 Blocks They Inspired by Laurie Aaron Hird. “E Komo Mai” is Hawaiian for “Welcome – Come In”. 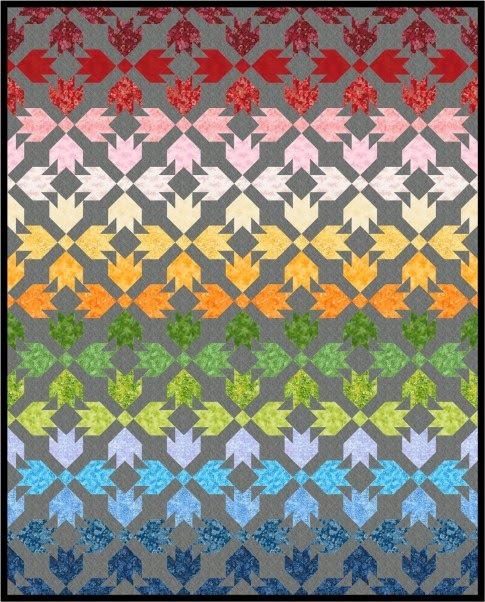 The quilt is a representation of a welcoming door mat, upon which visitors place their slippers/flip flops when entering. The surprise comes when you look carefully at the flip flops and see that they are three-dimensional. The straps stick out from the surface of the quilt, just like real flip flops! Ellen says, "I made this for my son when he moved into his home on Maui. 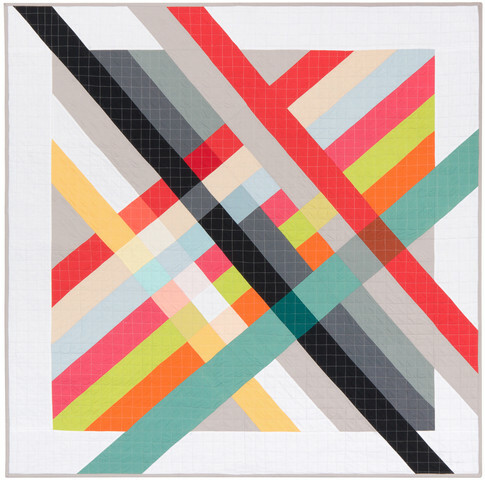 It’s one of my first quilts." 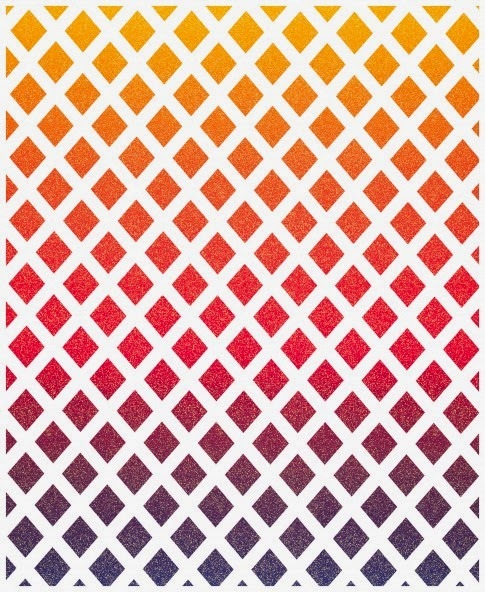 She says that the pattern is by Pattern Adaptation; we found it online at the Maui Quilt Shop. 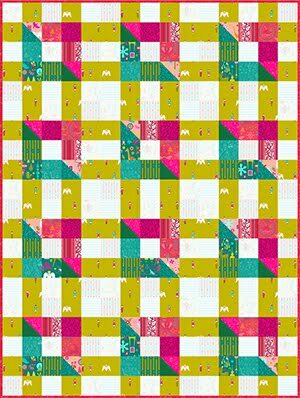 This happy cow, created with Kaffe Fassett fabrics and other prints, is based on the Jersey Girl pattern by Barbara J. Jones (you can see this fun pattern at BJ's Designs). 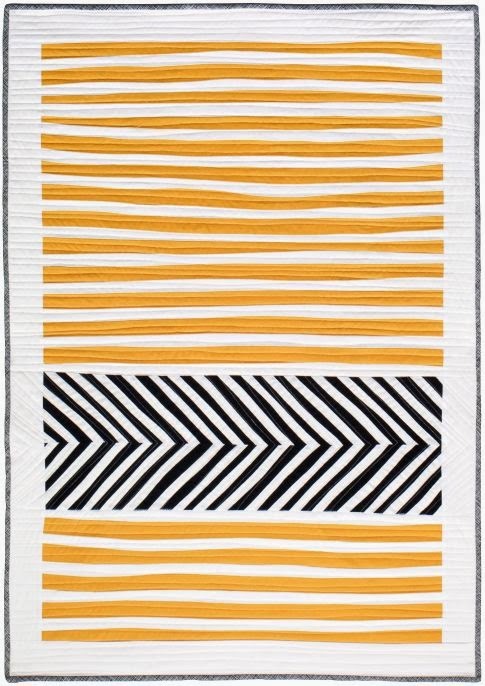 We admired the fabric selection and the beautiful machine applique work with blanket stitching, as shown in the photo below. Hooray for yo yos (and houses) ! 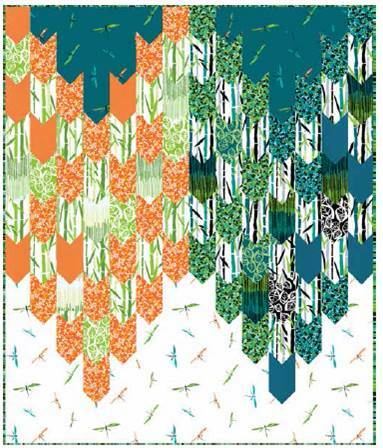 Maryann Maiorana says, "Two years ago, a friend introduced me to this pattern [by Bunny Hill Designs]. It was love at first sight. It was so much fun finding fabrics for the almost 200 yo yos." 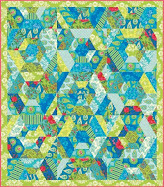 The border of whimsical houses, punctuated with yo yo trees and flowers, really makes this quilt! Maryann says, "Appliqueing the yoyos and houses made for great armchair handwork. My granddaughter, Natalia, has laid claim to it. We shall see." 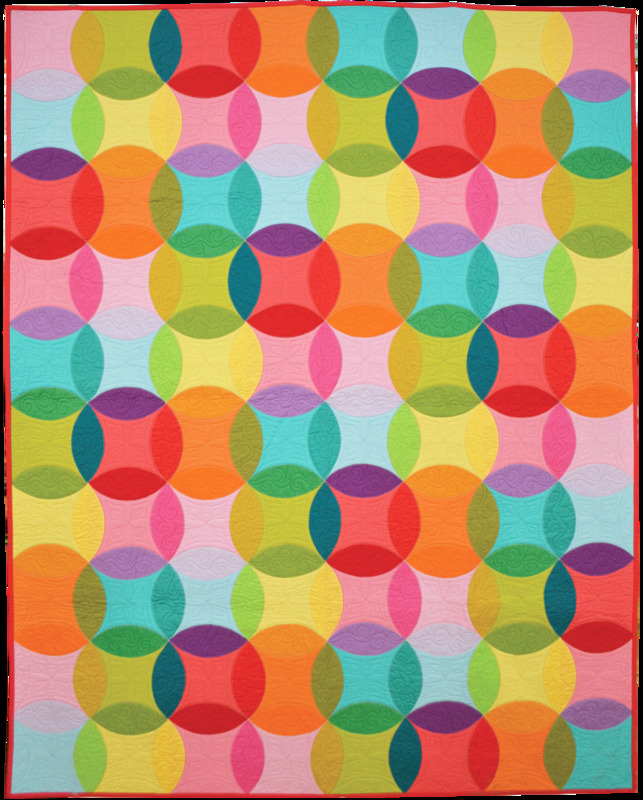 The center medallion is made from a print fabric that was quilted with wavy vertical lines. 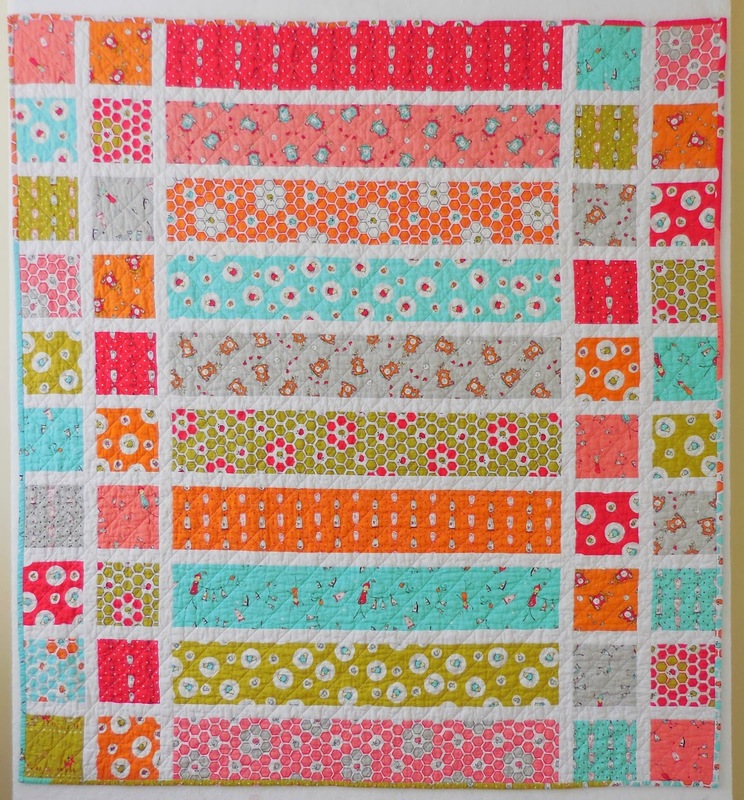 Catherine did a wonderful job piecing and quilting the outer rows of snowballs, as shown below.